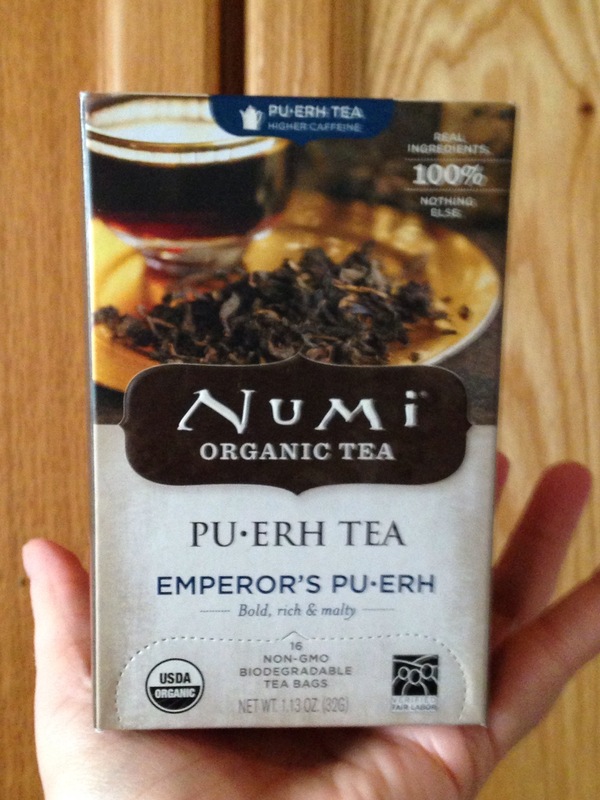 Today, I’m reviewing Numi’s Emperor’s Pu-erh. Of all the pu-erh I’ve tasted this one comes out as a good, basic, organic starting place that is pretty easy to find (though you may want to shop for the best price or look for a sale) and gives a baseline for what to expect from other pu-erh. At it’s best, pu-erh is earthy and woodsy. It can be almost pleasantly musty. Or it can smell and taste like moldy socks on a hot day. An old fish pond. Potting soil. Mushrooms. A hint of smoke. Chocolate. Malt. Sweet. And oily if that’s even possible. Sometimes there are hints of all of those flavors from the very same leaves. What the heck? Weird stuff. Numi Emperor’s Choice Pu-erh has just a hint of fishy smell or essence of seaweed aroma and a hint of smokiness. After steeping for a few minutes it tastes woodsy and earthy with a hint of resinous-ness (is that a flavor or even a word?). I don’t find much of a mushroom flavor in it, but it can have a bit of chocolate and malt. Overall the woodsy taste is pleasant. The fishy smell seems to dissipate fairly quickly, but it can be off-putting if you’re not expecting it. The brew is dark and slightly reddish. I can steep a couple of cups from one tea bag, but not as many cups as some of the loose leaf pu-erh that I’ve tried. Why in the world would anybody drink fishy dirt tea? Not all Pu-erh tastes like fish or dirt. Pu-erh is supposed to be chock-full-o health benefits, as is most tea. But pu-erh is supposed to be extra good for digestion, cholesterol, and weight loss. That sounds good to me. Plus I just plain like trying lots of kinds of tea. I first tried pu-erh several years ago, and I’ve been trying it again recently. I’m still not sure that I like a lot of it. And I feel like the more I know, the less I know. I learned recently that there are two kinds of pu-erh — raw (or Sheng Cha) and ripe (or Shu Cha). The raw variety is the kind that ages over many many years and develops a unique flavor. Sometimes it’s called green pu-erh. Or “aged raw pu-erh.” It can be pressed into bricks, cakes, disks, or tuo cha (little cup-or-bowl-shaped disks). Properly aged, it can become a coveted delicacy and quite expensive. If properly stored it will continue to age and change over time. The ripened version is also aged, but with a lot less time involved. The fermentation process is speeded up to mimic what can happen to the raw green version over many years. So the ripe kind is usually aged for a few months. (It can also be weeks or years depending on the tea.) Moisture is controlled. Microbes are added. It can be loose (and later bagged) or pressed into the same shapes as Sheng Cha.Then it becomes “ripe,” is dried, and is packaged. In the end, both Sheng Cha and Shu Cha end up a dark and almost reddish color with a mellow, complex flavor. Ripe pu-erh is the tea you’re probably going to find most easily in grocery stores or American tea shops. This is what Numi’s Emperor’s Pu-erh is. There probably aren’t many microbes still living on this tea further maturing it, but it may change some with age and it has a very long shelf life. I’m normally a fan of oolong, but find myself compelled to explore – especially Pu-erh. Oolongs can have such varied and complex flavors and from what I’ve tasted so far, so can Pu-erh. I have several older cakes I’d purchased a couple of years ago. One tastes fishy and the other like mushrooms. I love the one that tastes like mushrooms! Is it dorky if it reminds me of sitting in a dewy forest under a mushroom umbrella! (Shhh …) In looking for more similar to that, I purchased some of this Pu-erh Tuo Cha by Rishi. The Pu-erh Tuo Cha cakes are dark and fairly hard. If I score with a knife I can break one in half with my fingers. The brew is inky dark with a little red. The taste is smooth, deep and almost smokey with a few notes of mocha. Not bitter, but it gets strong quickly. If I search with my taste buds I can find just a hint of that mushroom taste. Perhaps this batch has a lot more aging to do. I think this is fairly “fresh” as it was purchased in Rishi’s new boxes instead of their old tins. I rather miss the tins, but understand. The box is 3.21 oz (91g) and contained about 12 cakes. I didn’t feel a need to rinse first, but I’ll try that next time. Good for multiple infusions. Steep times varied with second and third steeping. I want to explore more Pu-erh!